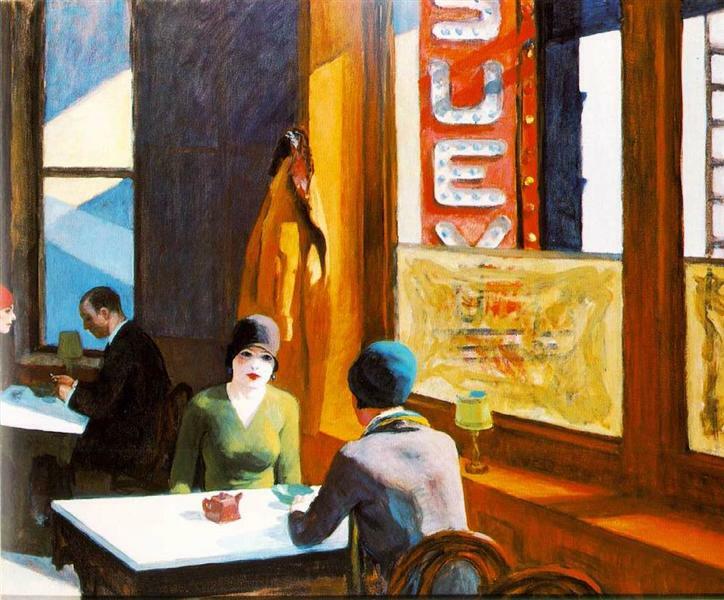 Edward Hopper said that Nighthawks was inspired by "a restaurant on New York's Greenwich Avenue where two streets meet," but the image, with its carefully constructed composition and lack of narrative, has a timeless quality that transcends its particular locale. 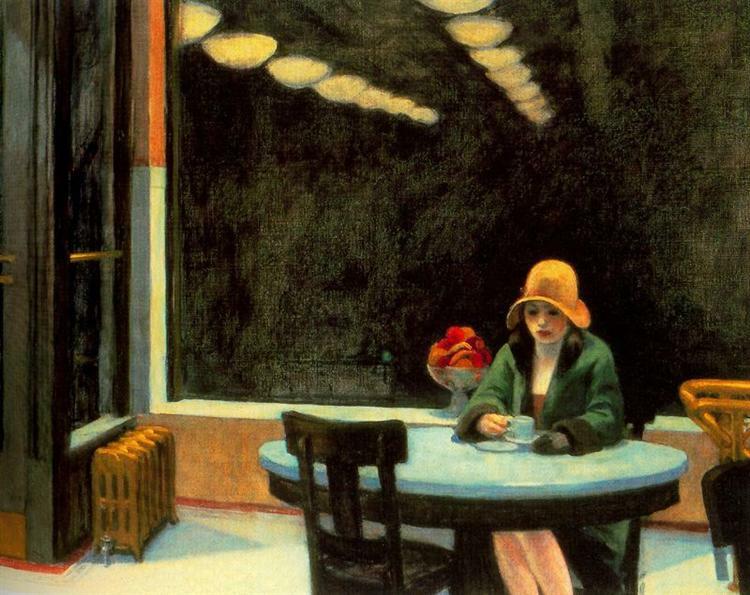 One of the best-known images of 20th-century art, the painting depicts an all-night diner in which three customers, all lost in their own thoughts, have congregated. Fluorescent lights had just come into use in the early 1940s, and the all-night diner emits an eerie glow, like a beacon on the dark street corner. 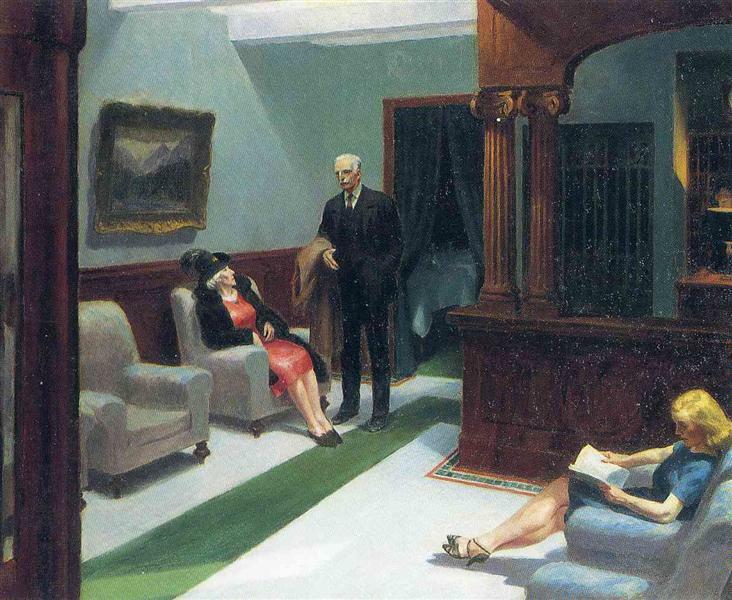 Hopper eliminated any reference to an entrance, and the viewer, drawn to the light, is shut out from the scene by a seamless wedge of glass. The four anonymous and uncommunicative night owls seem as separate and remote from the viewer as they are from one another. 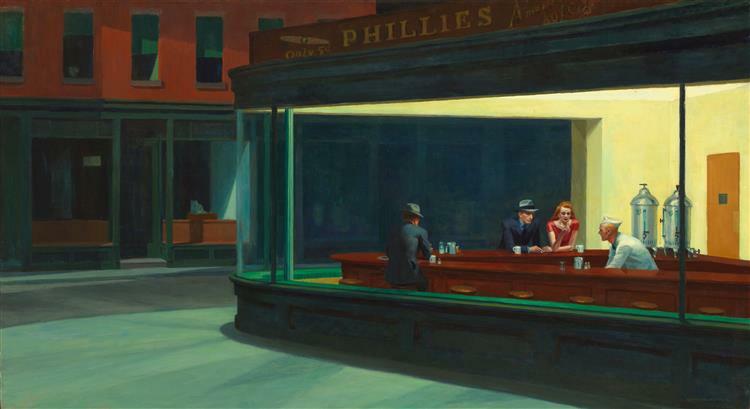 Reworked and parodied countless times, Nighthawks has become an icon of American culture. Nighthawks is a 1942 oil on canvas painting by Edward Hopper that portrays people in a downtown diner late at night. 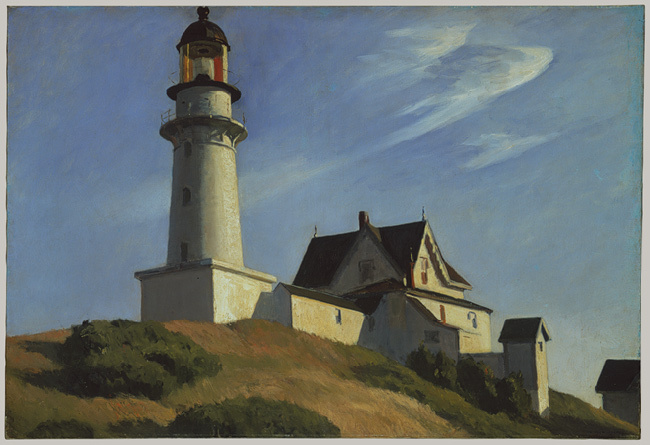 It has been described as Hopper's best known work and one of the most recognizable paintings in American art. 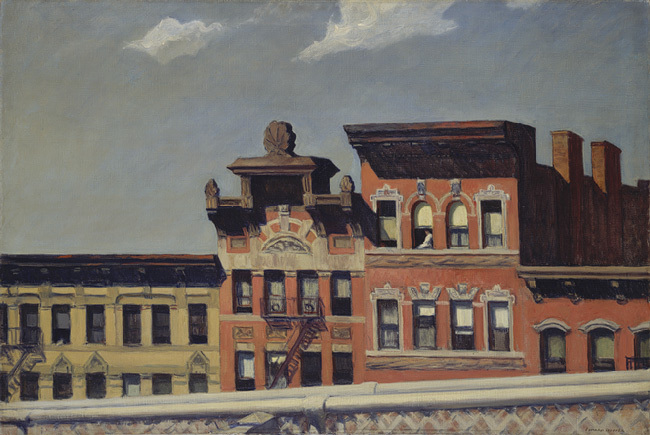 Within months of its completion, it was sold to the Art Institute of Chicago on May 13, 1942 for $3,000. 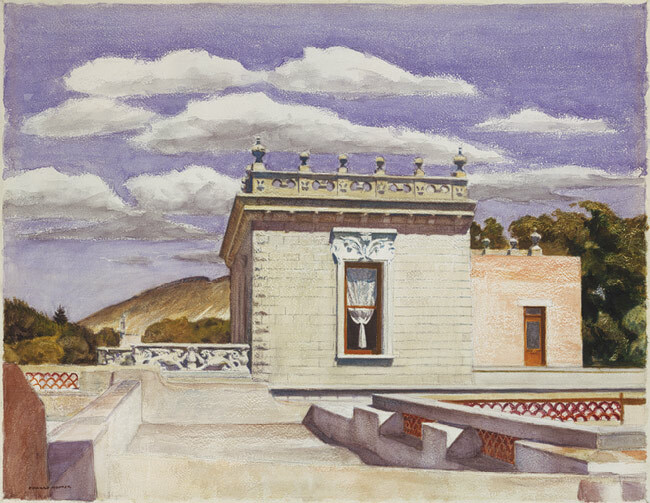 Starting shortly after their marriage in 1924, Edward Hopper and his wife Josephine (Jo) kept a journal in which he would, using a pencil, make a sketch-drawing of each of his paintings, along with a precise description of certain technical details. 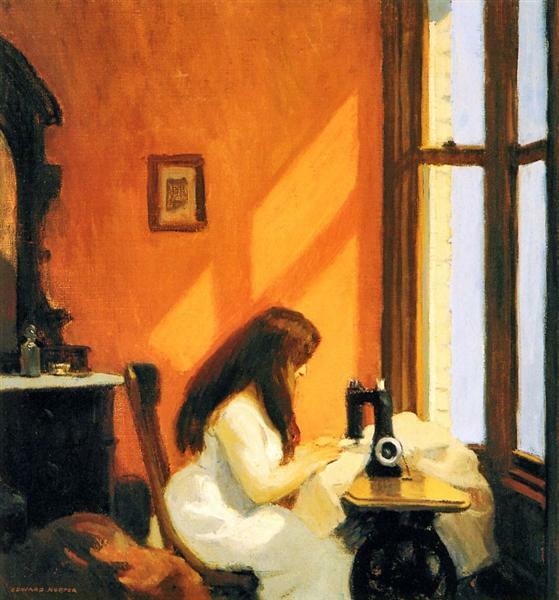 Jo Hopper would then add additional information about the theme of the painting. A review of the page on which Nighthawks is entered shows (in Edward Hopper's handwriting) that the intended name of the work was actually Night Hawks and that the painting was completed on January 21, 1942. In January 1942, Jo confirmed her preference for the name. In a letter to Edward's sister Marion she wrote, "Ed has just finished a very fine picture--a lunch counter at night with 3 figures. Night Hawks would be a fine name for it. E. posed for the two men in a mirror and I for the girl. He was about a month and half working on it." 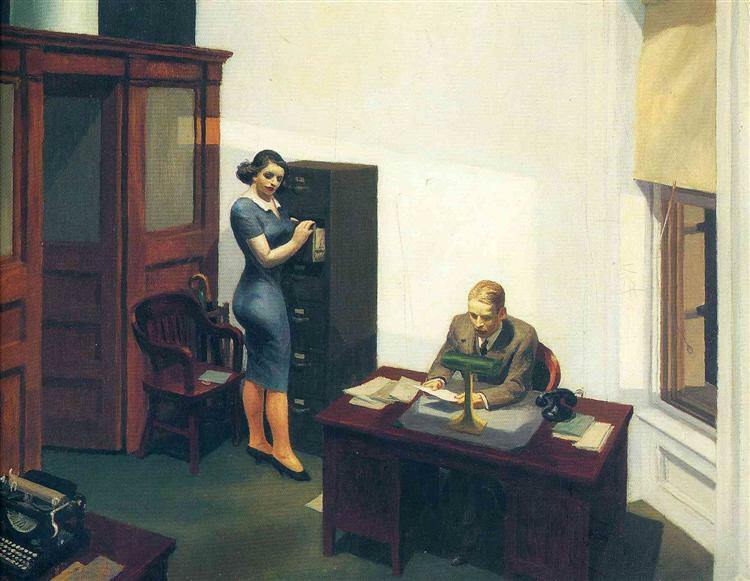 Upon completing the canvas in the late winter of 1942, Hopper placed it on display at Rehn's, the gallery at which his paintings were normally placed for sale. It remained there for about a month. On St. Patrick's Day, Edward and Jo Hopper attended the opening of an exhibit of the paintings of Henri Rousseau at the Museum of Modern Art, which had been organized by Daniel Catton Rich, the director of the Art Institute of Chicago. Rich was in attendance, along with Alfred Barr, the director of the Museum of Modern Art. 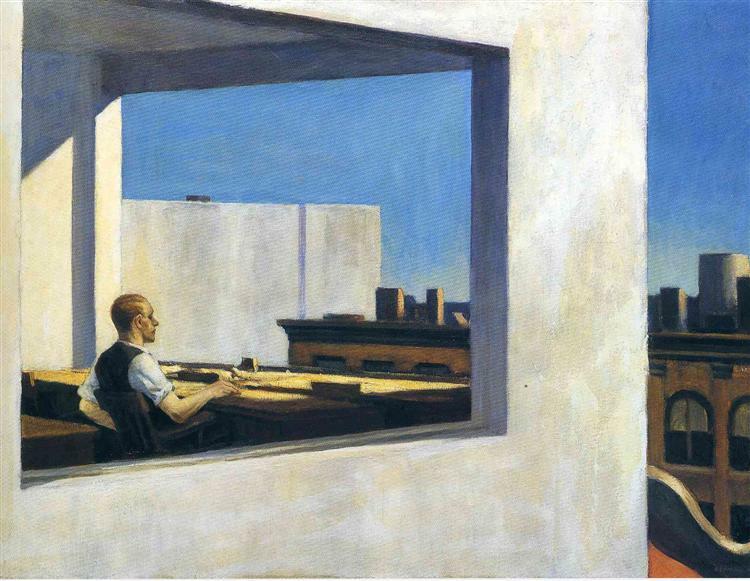 Barr spoke enthusiastically of Gas, which Hopper had painted a year earlier, and "Jo told him he just had to go to Rehn's to see Nighthawks. In the event it was Rich who went, pronounced Nighthawks 'fine as a Homer', and soon arranged its purchase for Chicago." The sale price was $3,000. The painting has remained in the collection of the Art Institute ever since. 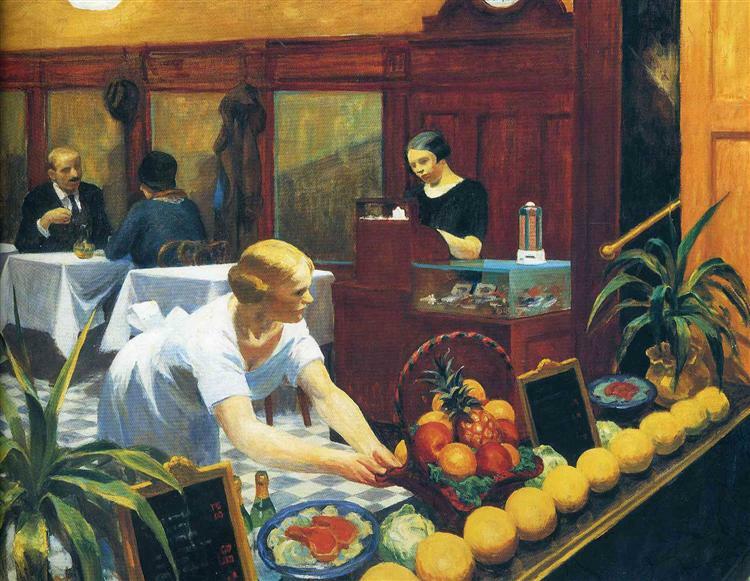 The scene was supposedly inspired by a diner (since demolished) in Greenwich Village, Hopper's neighborhood in Manhattan. 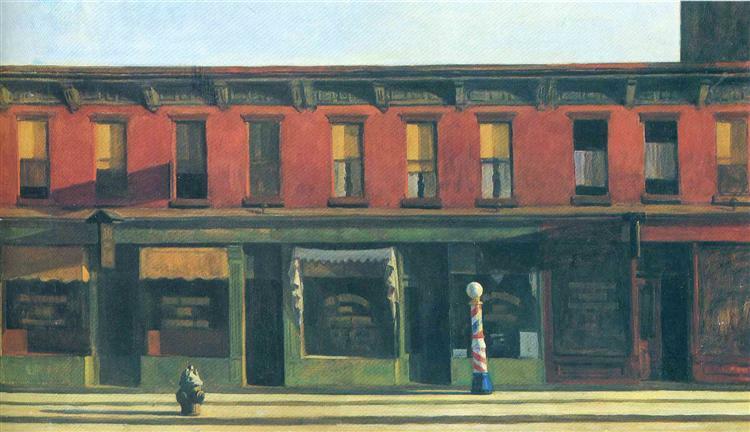 Hopper himself said the painting "was suggested by a restaurant on Greenwich Avenue where two streets meet." Additionally, he noted that "I simplified the scene a great deal and made the restaurant bigger." This reference has led Hopper aficionados to engage in a search for the location of the original diner. The inspiration for this search has been summed up on the blog of one of these searchers: "I am finding it extremely difficult to let go of the notion that the Nighthawks diner was a real diner, and not a total composite built of grocery stores, hamburger joints, and bakeries all cobbled together in the painter's imagination."